AUGUST 1, 2018: Late last night, the Legislature reapproved Mass Retirees proposal increasing the limit on public sector post retirement employment to 1,200 hours annually. The legislation, which is now known as H4821, increases the hourly limit part time work from the current limit of 960 hours to 1,200 per year. H4821 is now before Governor Charlie Baker, who has 10 days in which to either approve or veto the bill. May 22, 2018: The State Senate has voted to increase the hourly limit placed on retirees who return to part-time public service for a state or local entity in Massachusetts. Senators Michael Rodrigues (D-Westport) and Paul Feeney (D-Foxboro) cosponsored the measure as an amendment to the FY19 Budget, now under debate in the Senate. In an effort to enhance communication and outreach with Association members, Mass Retirees conducted its first Telephone Town Hall in November. Nearly 3,000 members participated in the hour-long call, with some 500 retirees remaining on the line for the entire duration. The New Year brings extra reason to celebrate for Mass Retirees members, as 2018 marks the Fiftieth Anniversary of our Association’s founding in 1968. In addition to the restyled newsletter banner, Mass Retirees plans to make the anniversary the focal point for much of 2018. Amongst other events, a special 50th Anniversary publication is planned for later in the year. 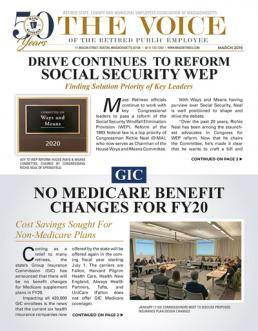 This publication will both chronical and celebrate the numerous achievements made by Mass Retirees over a half century. DECEMBER 21, 2017: Now that Congress has passed and President Trump has signed federal tax reform legislation into law, analysis is underway on what it means for retirees.